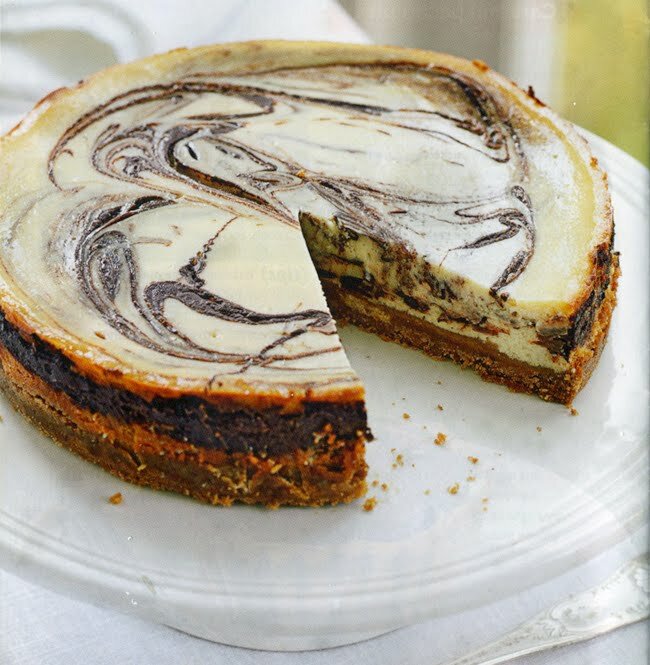 Boho Bandwagon: Chocolate Cheesecake – Yum! 150g dark chocolate (or chocolate bar) melted, cooled. 1. Line a 20cm springform pan with baking paper. Combine biscuit and butter and press into base of pan. Chill for 20 mins. 2. Preheat oven to 160C. Using an electric mixer, beat cream cheese, yoghurt and sugar until smooth and creamy. Add eggs, one at a time, beating well after each addition. Mix in vanilla. 3. Pour half of cheese mixture over crumb base. Spoon over melted chocolate. Top with remaining cheese mixture. Using a skewer, gently swirl chocolate into cheese mixture, taking care not to over-mix. 4. Bake for 45-50 mins, until cheesecake just sets. Turn off oven and cool in closed oven. Chill overnight before serving. From the December 2009 Australian Good Food Recipe Book.